All fired up to see the colors of the leaves, I was super excited to flee from the metropolis after an unseasonable hot spell and go to cooler regions of Nova Scotia and Maine. I packed my favorite sweaters, jackets and flannel shirts — I couldn’t have been more ill prepared for this voyage. The temperatures reached near 80 degrees during this excursion. Dare I say, climate change? I had to purchase t-shirts and augment my entire wardrobe for 7 days. It was hot during the day and so warm at night that I had to sleep with the cabin’s deck door ajar. More disappointing than this was the only tree colors that I witnessed ran the gamut from a vulgar shade of green to a muddy brown. Following are some insider tips and suggestions for those who are planning a cruise this fall to our friends up north. The interior of the ship was not lacking in color or colorful characters called passengers whom I precariously avoided for the majority of this trip. Considering most of them were in bed by 8:00 pm was also a factor. 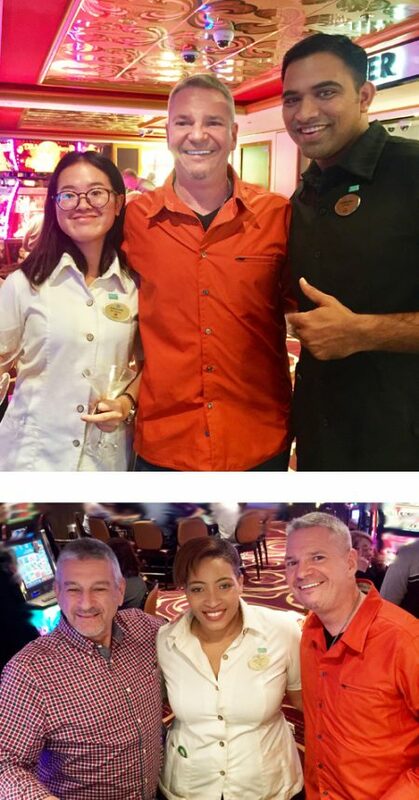 However, this voyage wasn’t a complete washout thanks to my travel companion Tony and the Norwegian Cruise Line staff that we encountered and spent most of our time with. There is good and bad news. You will not see a vibrant fall this year. Due to the lack of rain, warm temps with no frost, the trees are not bursting with color and I spoke with many folks from both Maine and Nova Scotia who have informed me that a lot of the leaves have already fallen off the trees due to heavy winds. That’s the bad news. The good news is you can still sail out of the big city, away from your office or anyone or thing you want to flee from and make your own fun. 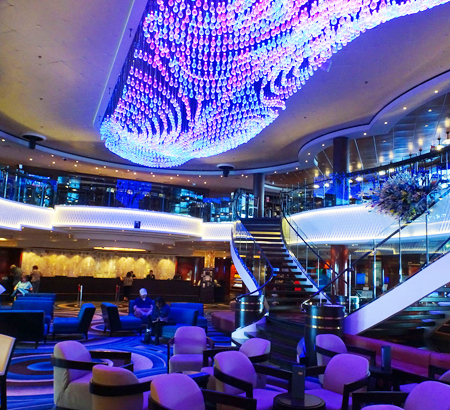 Everyone knows that cruises are basically about eating, drinking, gambling, shopping and being entertained. Norwegian Cruise Line has all of this. 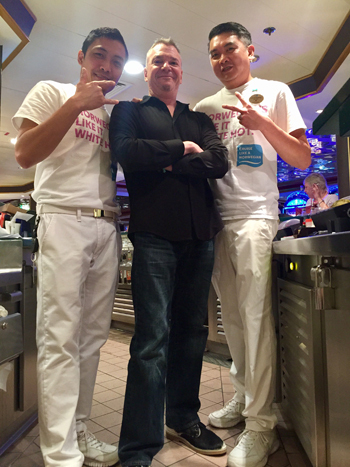 What I enjoy most about Norwegian Cruise Line (NCL) is their Freestyle Dining. What that means is you eat when you want and where you want — there are no two seatings at set times with the same waiter and same diners — this prevents you from getting stuck at a table with that guy with bad table manners or someone who dominates the conversation and laughs at their own jokes. All NCL ships offer regional cuisine and I noticed a more Asian and Latin influence on this trip. While many passengers make a mad dash for the buffet, I recommend that you elevate the experience at Le Bistro, Teppanyaki and/or Cagney’s Steakhouse. Here is what to expect at Cagney’s. The interior is warm and inviting with rich wooden veneered pillars, chrome ceiling light fixtures and sleek, white leather chairs. A geometric wall mural made with blocks of charcoal black, slate grey and white faces the frontline where professional servers coordinate with each other and the kitchen team. 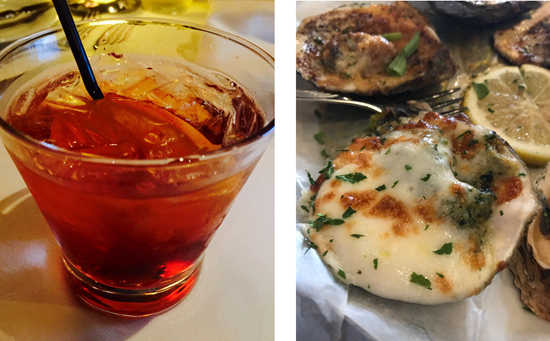 Starters include: Lump Crab Cake, Slow-Roasted Pork Belly, Chilled Colossal Shrimp and Beet & Goat Cheese Napoleon. I was drawn to the Oysters Rockefeller with Mornay sauce — it looked like a Béchamel sauce with shredded or grated Gruyère cheese added. I later learned that some chefs substitute chedder or parmeseano. While I looked over the menu, I was happy to notice that the Negroni was their only signature cocktail. I had to have one. Refreshing. Tip: You may want to pass on the Roasted Lobster Bisque with lobster morsels until you disembark in Bar Harbor. Entrees include grilled classics like Ribeye, Bone-in Ribeye, Porterhouse, Filet Mignon and New York Strip Steaks. Cagney’s also has featured selections like Bone-in Veal Chop, King-cut Prime Rib, Lamb Chops and Pork Chops. They also offer Surf & Turf. Tony and I opted for the latter. I was in the mood for trying something different to compare so I requested the Bone-in Ribeye while Tony ordered the Filet Mignon. The restaurant captain graciously agreed to my request. You get a choice of sauces such as green peppercorn, béarnaise, chimichuri, port wine ajus or barbeque. If you are craving steak during your trip, this is your best option. 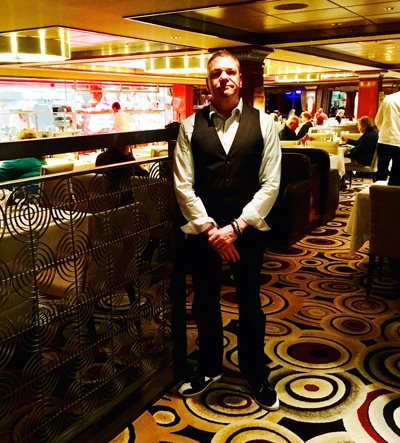 Tip: Make a reservation early, even before you board the ship especially if you have a specific night to celebrate. Availability fills up quickly. Note #1: When most foodies think of Surf & Turf we imagine Filet Mignon and Lobster tail. 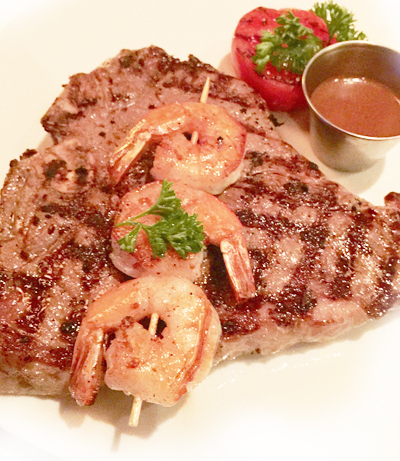 During this visit at Cagney’s, our steaks were topped with 3 grilled shrimp on a skewer. 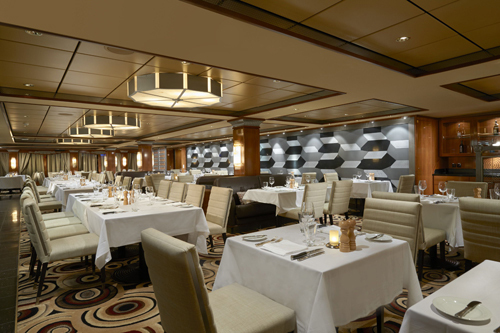 Note #2: In the past the NCL upscale restaurants were set at an additional prix fixe. Currently at Cagney’s is an ala carte menu with prices comparable if not a bit less expensive than dining out in NYC. 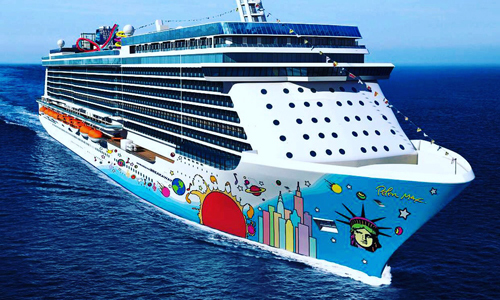 Activities on board include gaming once at sea, a fully equipped work out room with ocean views, there will be a comedy troupe and several shows that include singers and dancers with Broadway training. While the casino is on the small side, you might want to try your luck if that is your thing, We actually saw one passenger hit the jackpot on one of the machines. What made this trip most enjoyable is the staff who will be on board through the fall leaving from NYC to Halifax, St. John, Bar Harbor and Portland. Kudos to Popo, Nicolas, Singh, Beejay, Huang, Stanko and Arnold for making the journey most enjoyable. After docking at each port, they went above and beyond the call of duty to make sure we had everything that we needed and a good time. 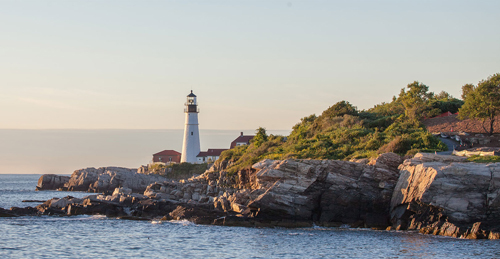 Tip: My most favorite port was Portland, Maine. The people are incredibly friendly and you will see a parade of cruisers heading to the old port for lunch. I recommend you visit Boone’s Fish House and Oyster Room. While the views of the harbor are obstructed, the cuisine is remarkable. Note: Try the Boone’s Baked Stuffed Lobster as featured on the Travel Channel. It’s a 1.5lb Maine lobster split and stuffed with lobster and scallops — just like Alexander Boone created at this exact location in 1898. While my quest to see fall foliage fell short of my anticipation and expectations, getting away from the daily grind is something we should all aspire to for rest, relaxation or to let your hair down. Traveling is always good for the soul and fall cruising assures you that the kids are in school until the holidays. Tip: Inquire about priority disembarkation. 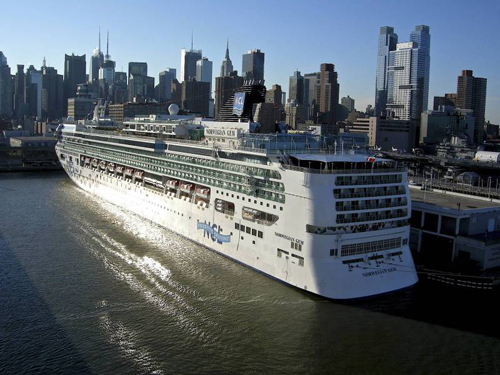 Note: NCL ships to Canada and Maine depart every Saturday afternoon from Pier 88 on the Hudson River in Manhattan. Read our Travel Section every month for original stories and insider tips. It Time To Visit Cuba!